* Replaced bitumen and felt dampening with 3/4" Sonic Barrier from Parts Express. * Crossover is located in separate compartment in base of speaker. * Only included 3 internal braces instead of 4. * All panels constructed from 18mm Baltic Birch. I think it is important to make mention about the break-in required by these drivers. When I gave these speakers their first audition, I was very disheartened. The lower midrange and bass was severely restricted, and the treble was very bright and harsh. My stomach made several turns while I thought about the large expenditure made to achieve this poor result. 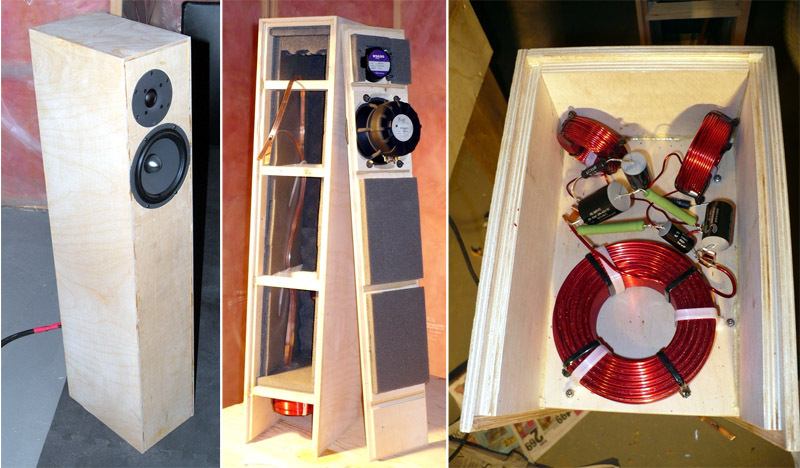 But taking some hints from your site, I gave the speakers some heavy break-in consisting of about 150 hours of a repeating 40Hz test tone played at decent sound levels. This made an enormous difference. The tonal balance of the speakers became very even, the bass is very extended (I'd say usefull output to 35Hz) and the treble is clean and clear but without any trace of hardness. For anyone else building the CNO's, be forewarned: Heavy break-in is required before these drivers will reach their potential. Now that the speakers are well broken in, they are wonderfull. Soundstage is spacious and focused, tonal balance is very good, and transient response is very fast. As my wife says, "These sound more real than anything else we've had." I can't wait to see what else you come up with using Seas Nextel drivers.